University of Melbourne Vice-Chancellor Glyn Davis recently released a statement in this newspaper regarding its fossil fuel investments. This came in response to our campaign, Fossil Free Melbourne University, which is calling on the University to stop investing in companies whose primary business is the extraction, exploration, processing and transportation of fossil fuels. While the statement never explicitly declined the call to divest, we can only gather, from the excuses offered, that this was its intention. This response reveals the absence of a serious commitment to the environmental rhetoric put forward by the University and a failure to recognise the profound ties between financial decisions and their destructive consequences for the environment. Moreover, the assertions made in the statement around financial risk, which form the basis of the University’s decision not to divest, do not accurately reflect recent findings in this field. Work done by UK-based think tank Carbon Tracker and Oxford University’s Smith School highlight that fossil fuel assets are at grave risk of becoming stranded, given the necessity to keep fossil fuels in the ground to maintain a safe climate. Through legislation that limits emissions, the growth of renewables and social and political pressure, these reserves will be kept in the ground. What this means for the fossil fuel industry is that their assets are overvalued and we are sitting on a speculative carbon bubble unless we start to account for these risks in our financial system and act accordingly. Not only are fossil fuels assets increasingly risky, a point not fully explored in Professor Davis’ statement, but the arguments put forward around needing to continue to invest in fossil fuels to maintain profitability are not in keeping with the facts. Last month, the Australia Institute, in collaboration with Investment Management Firm Aperio Group, released a paper demonstrating that ASX fossil-free portfolios come with a 0.001 (negligible) performance impact. There is a wealth of evidence that shows that socially responsible investment portfolios do not suffer performance penalties. We know that this evidence is available to the University’s Investment Management Committee, which makes us especially disappointed about the superficial level of engagement at which they have chosen to approach the issue. Furthermore, we think it is extremely problematic to frame divestment in a way that pitches “financial responsibility” against social and envionmental responsibility, as though these outcomes can be disentangled. We know that carbon investments can only ever be short-term. If we want to avoid global warming of beyond 2°C, we must act in this decade and we cannot burn (and thus buy or sell) most of the carbon we can access. Fossil fuel investments are still profitable because investors and the fossil fuel industry continue to bet against climate change. When the University chooses to ignore this, it is complicit in that bet. We recognise that changing its portfolio will initially require the University to do additional work. This is work that needs to be done to fulfil its commitment to sustainability. The cost of divestment now is small, especially when shouldered by large institutions, compared to the devastating costs of climate change impacts that will be shouldered by individuals and communities. The statement lists the University’s impressive sustainability credentials. While this work is important, we don’t see its relevance to the issue of divestment. It doesn’t make sense to use the work being done towards solutions on the one hand as an excuse for the damage enacted on the other. We call on the University to approach climate change with the seriousness it deserves. We sincerely hope the University will reconsider its decision not to divest, both from the perspective of financial risk and its responsibility to future generations. This morning a group of University of Melbourne students attempted to deliver a letter to Vice-Chancellor Glyn Davis asking him to “resubmit or fail” his “assignment” on the University’s exposure to fossil fuel investment. This comes in response to the Vice-Chancellor’s recent announcement that the University would continue to invest in fossil fuels, despite calls by students and staff to make the commitment to divest by June 30 this year. The students, dressed as professors, gathered outside the building that houses Glyn Davis’ office. While a number of students attempted to enter the building to personally deliver the letter to Glyn and request a meeting, the remaining students stood outside chanting loudly to be allowed entrance to the building. Security personnel refused entry to the students, who eventually capitulated, allowing the letter to be delivered via the security concierge. “Considering the IPCC’s most recent findings regarding the gravity of climate change risk, their refusal to divest, combined with their unwillingness to meet with us this morning, all suggest that the University does not take their responsibility for the future of their students seriously” lead campaigner Vicky Fysh commented. Melbourne University professor and IPCC author David Karoly was quick to point out inconsistencies in Davis's statement. "Universities present themselves as leaders in sustainability through research, innovation and campus sustainability initiatives, yet continuing to invest in fossil fuels shows they are more than happy to talk the talk but they also need to walk the walk." "Mr Davis writes as though shedding fossil fuel investments is risky," said Miss Fysh. "It's a common misunderstanding, but the research shows the risk is all on the other side." Recent modelling done by Investment Management Firm Aperio Group suggests that screening out fossil fuel extraction and downstream industries from Australian investment portfolios would have negligible impact on returns. At the same time, think tank Carbon Tracker are warning of stranded fossil fuel assets and a carbon bubble, should investors like the University of Melbourne continue to invest unabated in fossil fuel reserves that are unlikely to be burnt in a carbon-averse world. “We are urging the University to enter into further discussions with us about this issue. There is a still a chance for the University to reconsider its decision and show themselves to be genuine leaders in sustainability” concluded lead campaigner Vicky Fysh. To see the Aperio Group modelling, see this report. Did you catch our action outside Raymond Priestley Building today? In case you missed it, a group of 'Professors' from the Fossil Free school of ethical investments delivered their response to Vice Chancellor Glyn Davis' statement that the University does not intend to divest. Check out the full tutor's comments below. Glyn got schooled! The IPCC’s report released today shows that everything, everywhere is already being affected faster than anticipated by increases in greenhouse gas from burning fossil fuels. It’s another harrowing message encouraging our push back against the dangerous coal and gas industries and their government and financial backers, including the University of Melbourne. Glyn Davis' response to our call for divestment was insufficient and hypocritical. The University of Melbourne cannot call itself a sustainable University whilst it continues to profit from climate change. We students will feel the effects of the climate crisis in our lifetimes. Our futures matter to us, and they should matter to our University too. We will not be giving up on this fight until Glyn submits the correct response: divestment! Thank you for submitting your assignment on Melbourne University’s exposure to fossil fuel investment before the June 30 deadline. You’ve obviously worked hard to get it in early, however there are serious inconsistencies in your piece. On one hand, you’ve developed your point regarding Melbourne University’s sustainability credentials as both a teaching and research institution quite well. Indeed, you spend most of the assignment developing this theme, and provide a good range of evidence to support it. You have failed however to extend that logic to the final section of the assignment, where you discuss investment practices. We also noticed your assignment was submitted the same day we learned your classmate, Monash University, has taken the cynical approach of pretending not to have listened when the question about fossil fuel exposure was asked. Given your maturity, we’d hoped you’d provide a better example. Unfortunately, given the circumstances and the similarity of your responses, it appears that you have plagiarised Monash’s work, something as you know the academic community takes very seriously. In its current form, we cannot give your answer a passing grade. However, given that the assignment is worth 100% of marks for this subject, we’re giving you the opportunity to resubmit. You have until June 30. Use it well. A day after an embarrassing leak revealed that Monash University's Chief Financial Officer wanted to pretend it hadn't been asked about its investments in carbon-intensive stocks, University of Melbourne Vice Chancellor Glyn Davis has released a statement resisting calls to divest from fossil fuels. Mr Davis's statement drew attention to the university's sustainability credentials but argued its hands were tied by commitments to past donors and that getting rid of fossil fuel stocks was financially risky. However, the leaked email from Monash University's CFO David Pitt suggested that the entire 'Group of 8' have discussed presenting a united front against calls for them to divest, a link strengthened by the timing. "It could be a coincidence, but it certainly looks like collusion," said Fossil Free Melbourne University lead campaigner Vicky Fysh. "It's disappointing that Melbourne University can't bring itself to lead on this issue. The university can't live up to its own press when it comes to climate change." 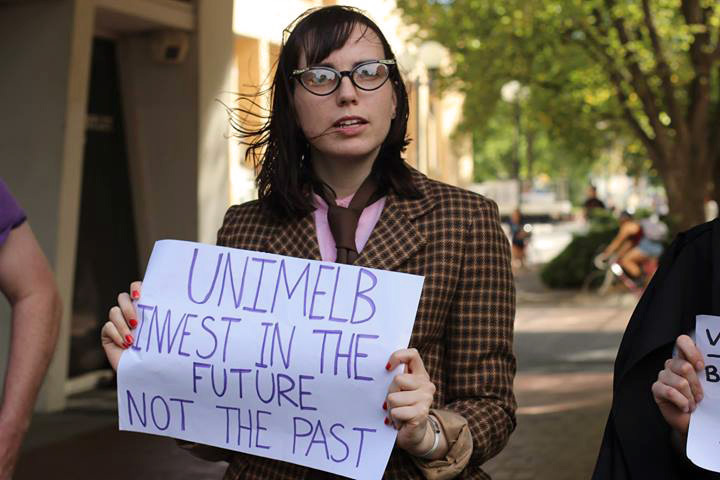 "The University of Melbourne and all universities should divest from fossil fuels because fossil fuel assets are over-valued and pose a threat to these universities' investments. Universities present themselves as leaders in sustainability through research, innovation and campus sustainability initiatives, yet continuing to invest in fossil fuels sends the wrong message. They are more than happy to talk the talk but they also need to walk the walk." "On the one hand Melbourne University has invested real time, effort and money in its sustainability commitments," said FFMU member Noah Beecher Kelk. "Yet they seem to forget that when it comes to where their money sits. It's short sighted and risky." The Fossil Free Melbourne University campaign, active on campus for the last eight months, argues that investments in fossil fuels are both financially riskier than markets are accounting for, and unethical given fossil fuels are a major contributor to dangerous climate change. Recent modelling done by Investment Management Firm Aperio Group suggests that screening out fossil fuel extraction and downstream industries from Australian investment portfolios can have negligible impact on returns. At the same time, think thank the Carbon Tracker Initiative are warning of stranded fossil fuel assets and a carbon bubble, should investors like the University of Melbourne continue to invest unabated in fossil fuel reserves that are unlikely to be burnt in a carbon-averse world. “It is time for Melbourne University to show students, staff and the wider community that they are really committed to climate change abatement by divesting from fossil fuels” concluded FFMU Communications Director Josie Ryder. 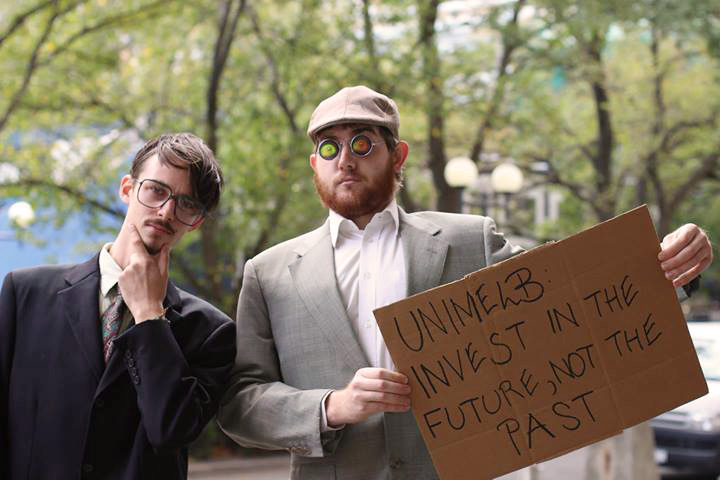 'Does the University of Melbourne invest in fossil fuels?' ask posters around campus. Posing the question has triggered a lively discussion among the governing Council, and with our institutional advisors. Ethical investment is an important topic, and the debate is very welcome. The starting point is shared recognition of the challenge. The University works through expert third parties in managing its investment portfolio. At the same time, sustainability and resilience are among the three grand challenges shaping the University's research agenda. On one estimate over 1,300 researchers and around $218 million annually is involved in research across energy, water, carbon management and related domains at Melbourne. Many key research partnerships take sustainability as a key problem, including all planning for the new Carlton Connect precinct. For example, the Melbourne Energy Institute undertakes projects in energy policy, energy system optimisation and geothermal and data fusion. The Melbourne Sustainable Society Institute investigates sustainability as a societal goal, and seeks to link and integrate relevant research from across the University and beyond. Sustainability is a core graduate attribute, and guides much teaching and learning on campus. Students can choose from masters level degrees offered through the Office for Environmental Programs and the undergraduate offerings of the Bachelor of Environments. Many faculties offer breadth sequences in sustainability issues, from subjects on climate change, climate and water, ecology, and people and environment to graduate offerings such as the Master of Energy Systems. fibre-to-the-premises broadband access networks. Other projects include a geothermal pilot demonstration project on the Parkville campus. There is a similar story to tell about shared goals on environmental impact. The University has set an ambitious target to achieve carbon neutrality by 2030 and since 2008 has undertaken a range of projects to reduce energy consumption and carbon emissions. The record so far is encouraging - energy reduction projects completed between 2008 and 2013 are now contributing an estimated 32,000 tonnes of ongoing annual carbon savings. Initiatives focus on upgrades to heating, air conditioning and lighting systems. A parallel program addresses water consumption through rainwater and storm water capture, water-recycling, leak detection and efficiency upgrades. Further, the University maintains a commitment to a minimum of 5-star Green Star design rating for new buildings and minimum 4-star rating for major refurbishments. These important initiatives owe much to the commitment of the University Council, faculties, centres and the team at Property and Campus Services. A University Sustainability Forum, now in its fifth year, provides leadership across academic programs, research and engagement and operational activities. New programs are highlighted at the Campus Sustainability Centre. How should this agreement about the importance of sustainability, and the need for practical action, shape the University's investment portfolio? The University of Melbourne is one of the largest trustees of charitable trusts in Australia, with more than 830 charitable trusts established by gifts or bequests over the past 160 years. The University's investments provide income for a wide range of University purposes, including funding for scholarships, bursaries and prizes for students, staff fellowships, academic positions, research funding, books and publications, faculty equipment and physical infrastructure. Given the amounts of money involved, and the trust donors place in the University when they provide money, Melbourne engages external industry experts to manage the investment portfolio. A Council appointed Investment Management Committee (IMC) sets broad parameters on asset allocation, risk and growth strategies. These include a strong preference by the University for investment in Australian equities, but specific investment decisions are made by an external funds manager, the Victorian Funds Management Corporation (VFMC). alone, and supports long term investment for future growth. The University requires the VFMC to adopt and implement environmental, social and corporate governance policies for investing. It must take into account environmental, social and corporate governance considerations when making investment decisions, and report regularly on environmental, social and corporate governance matters to IMC. The VFMC is a signatory to the Principles for Responsible Investment. The campaign organised by environment group 350.org has prompted much governance reflection on how University funds are managed, and a sustained discussion about the ethical issues involved in any investment choices. Consultation with the University's institutional advisers has confirmed the higher management costs, and likely lower returns, of customising a portfolio that excludes certain types of investment, such as all companies working in any area with direct or indirect interests in fossil fuels. The IMC has wrestled also with the practical difficulty of reconciling a preference for Australian equities with the realities of the local economy, should companies with direct or indirect links to fossil fuels be excluded. Among allied issues considered were the costs to future students from reduced returns, and the question of trust with past benefactors. Donors provided money to the University for specific purposes, often scholarships to assist current students. To take decisions that reduce the investment returns available for this purpose is to presume the preferences of those who created the endowment through their donations. As trustee, the University has a fiduciary responsibility to carry out the trust terms and preserve the trust capital by prudent investment. One argument advanced by 350.org and the related campaign is the poor long-term prospects for fossil fuel companies as their products become less socially acceptable. The University acknowledges through its investment beliefs that companies which effectively manage their environmental, social and corporate governance responsibilities should give better risk adjusted returns over the long term. IMC has committed to monitoring closely the potential impact of climate change issues on the value of investments, and working with VFMC on the risk profile of fossil fuel investments. It is for investment experts, though, to make the judgment calls about how the market will treat particular types of current and future investments. investment portfolio managed by VFMC, the University will, subject to certain conditions (such as the quantum of the endowment, which must be significant), establish a separate specific investment fund. The investment returns will be specific to the fund and may therefore be subject to greater volatility than those of the VFMC managed fund, and the cost of managing that fund may also be greater. Nonetheless, this will allow donors to decide the balance of risk and return they consider appropriate for their contribution to the future of the University of Melbourne. The 'Fossil Fuels' campaign raises important issues and is to be welcomed. Through revised investment arrangements we can ensure funds received in future are placed in the market in ways consistent with the intentions of donors. The Council's Investment Management Committee will continue to work closely with VFMC on investment strategy, knowing the returns achieved support sustainability and resilience through research, learning and engagement. Melbourne University students are outraged by revelations of collusion among Australia’s largest Universities to block public access to information on how they manage the climate change risks of their investments. Lateline last night revealed that Australia’s Group of Eight (Go8) universities had colluded in a botched plan to avoid scrutiny over their long term investment strategies, specifically regarding a plan for dealing with the financial risks of climate change and fossil fuels. The information was inadvertently supplied by Monash University just hours after a request by the Asset Owners Disclosure Project (AODP) for such disclosure from 300 universities, worldwide. The AODP’s disclosure request comes as institutions in Australia and overseas face increasing pressure to limit dangerous climate change by divesting their shares in fossil fuel companies. According to a University of Oxford Study, the fossil fuel divestment movement, led by 350.org, is growing faster than any previous divestment movement, with campaigns underway at over 400 universities worldwide. “This is an incredibly disappointing move by Melbourne University. I have no doubt many members of the student and staff community will be feeling very let down by our University today” said Vicky Fysh, Fossil Free Melbourne University Campaign Coordinator. 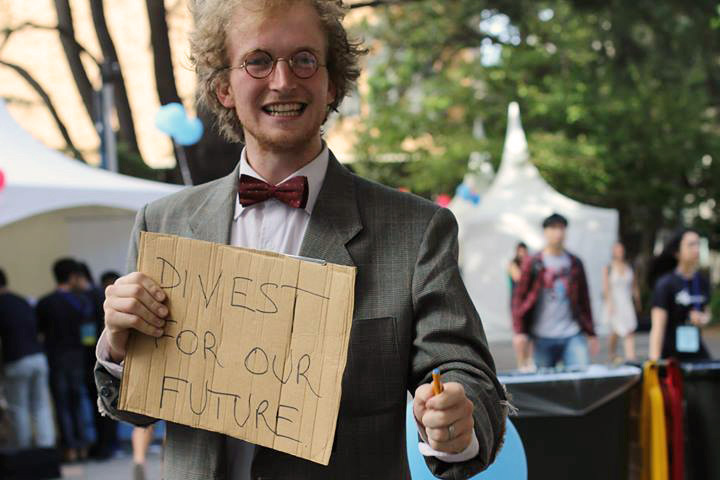 “Whilst Melbourne University might debate the merits of fossil fuel divestment, being open and transparent about where they’re investing their money is a social obligation. It’s part and parcel of the transparency expected of publicly accountable institutions,” said Miss Fysh. “It is absolutely hypocritical of Melbourne University to play such a leading role in the research and understanding of climate impacts and mitigation, yet to refuse to engage in this essential discussion about transitioning to the low-carbon economy of the future” Miss Fysh said. Miss Fysh asserts that collusion on behalf of universities will only serve to galvanise the student movement in Australia, as has occurred with the campus divestment movement in the US. View the full Lateline story here. The 2014 Global Climate Investment Index can be accessed here.